Another great Will Bake for Food is in the books. With a donation total of over $2500 and a wagon full of donated goods, the two Jennys have created another fun community undertaking. From the army of food bloggers that showcased their wares to the throngs of giddy customers, we had a great time and enjoyed being involved with it. Thankfully, all of the festivities were to benefit the noble efforts of the Emergency Feeding Program of Seattle and King Country. And here is how to make the baked goods I brought to the hoedown. I’ve already shared my recipe on how to make my version of granola, so please visit the post. The key takeaway; granola is easy to make and your imagination can create any combination that you like. Feel free to add nuts, dried fruit, candy, or anything else to your mix. The important part is knowing the ratios and not adding too much bulk that it won’t brown. And keep an eye on the granola after 60 minutes; this is the moment where it’ll start turning golden brown, feel free to stir to distribute the granola. Growing up in Seattle, shopping at Nordstrom is a rite of passage. As a kid, the opportunity of having a Nordy Bar from the Nordstrom Cafe was a highlight of these trips. It was a perfectly dense, slightly rich, and delicious sweet treat. A hybrid between a blondie and a cookie, this was one of my favorite things about Nordstrom visits. A recent twitter chat with some friends brought the Nordy Bar back into my mindshare. Naturally, it was to be made for Will Bake for Food. I did a bit of research and landed on this recipe that seemed close. Wanting to elevate it a bit, I thought of browning the butter to add that distinct nuttiness that brown butter gives. 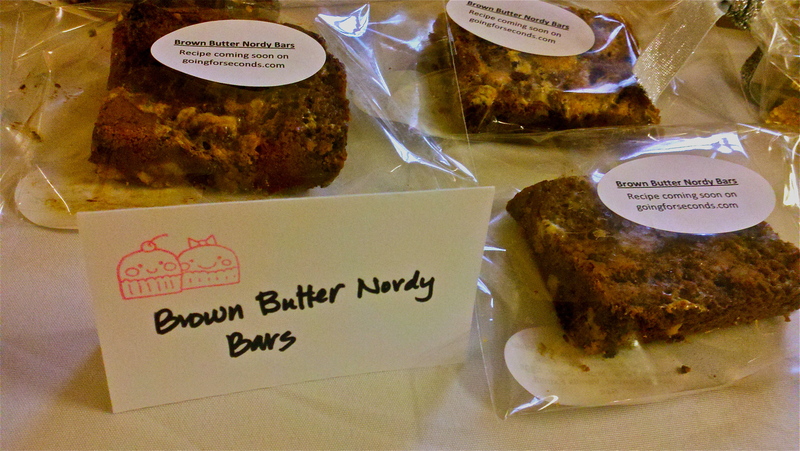 The Brown Butter Nordy Bars were excellent. But they weren’t exactly a Nordy Bar as I remember it. I think I’ll spend some time researching the Nordy Bar and tweaking the recipe to see if I can create that perfect snack that I had growing up. And maybe start a grassroots campaign to have Nordstrom bring it back. Stay tuned. These cookies have been written ad nauseum on the blogosphere and I wanted to include my take on these delicious cookies for Will Bake for Food. Made famous by New York’s Momofuku Milk Bar, the chief baker, Christina Tosi used the notion of clearing out your pantry of various sweets and savory snacks to use in a cookie. It is awesome. I’ve had the benefit of having the original cookie at the Upper East Side Milk Bar and through their online ordering system. But the recipe for making them at home hasn’t been crystal clear. Before the recipe was released in the Momofuku Milk Bar cookbook, plenty of bloggers offered their take on how to make it. Some were close, but weren’t quite there. Then, the Amateur Gourmet found the recipe on the Live! With Regis and Kelly website, which is oddly random in its own right. So the recipe was available for all. Still, they weren’t quite right; they were close, but they weren’t the perfect compost cookie. I made a few different batches after reading the comments in the Amateur Gourmet posts and noticed that others shared my issue; the cookies ran, the ratios were a bit off, etc. Then the Momofuku Milk Bar cookbook came out this fall. Bakers rejoiced. I was able to see Christina Tosi recently at Seattle’s Book Larder to talk about the book and her history at Milk Bar. One of the chief takeaways that I had was her use of glucose in baked goods. This bit of food science was something she picked up from kitchen experience and cooking school and something I’ve never considered in baking (she’s a pro for a reason, folks). Glucose is an invert sugar syrup that aids in keeping the cookie crisper longer and add body and texture. I wouldn’t have known this without hearing Chef Tosi talk about her baking techniques. I now think I’ll work glucose into more of my baking. Arrange cookies on sheet pans lined with parchment of Silpat liners. Scoop cookie dough in equal sized ball (a little larger than a golf ball) place 6 cookie dough balls per sheet pan.